Students are taken out of their comfort zone to experience a year in the country. Additional writing tasks offer great options for extra work. List things that are different between Mary Alice's world and the present. Translate two different expressions Mary Alice uses to describe her grandmother. Put events from the story in order as they happened with Mary Alice and Grandma on Halloween. Write a letter to Mary Alice's mother in her own words in an attempt to change her opinion of the grandmother. Students identify who the antagonist of the story is and defend their opinion. Create a travel brochure for Chicago, Illinois. Aligned to your State Standards, additional crossword, word search, comprehension quiz and answer key are also included. 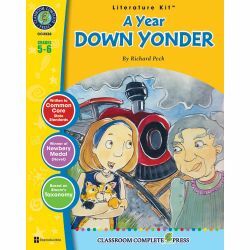 About the Novel: A Year Down Yonder is a Newbery Medal-winning story about a young girl who must spend a year living with her grandmother in the country. Mary Alice spent her childhood summers staying with her grandmother in a small country-town in Illinois. These summers were packed with enough surprises and drama to fill the double bill of any picture show. Now, Mary Alice is fifteen and must spend a whole year with her grandmother, away from her Chicago home. Over the course of the year, Mary Alice experiences a hurricane, fox-hunting by night, a late-night raid of a pecan tree and pumpkin patch, a huge snake in the attic, and a community rife with hardship and social pretenses. 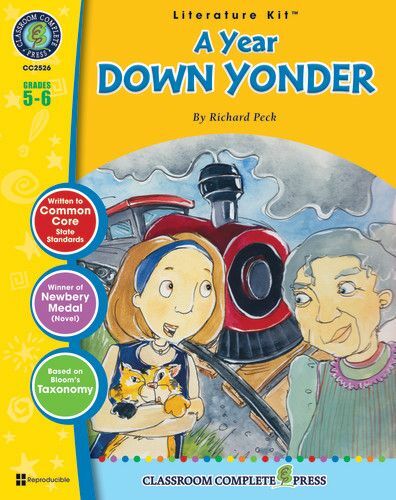 A Year Down Yonder is a hilariously funny and heart-warming novel.